Wright Medical wants to make you aware that Medicare is significantly increasing inpatient hospital reimbursement for total ankle replacement (TAR) and revision of TAR procedures effective 1 ottobre 2017. This 55% reimbursement increase – almost $7.000 – is intended to better align Medicare payment to hospital costs and ensure Medicare beneficiary access to these important ankle surgery procedures. We are providing key details about the new TAR payment below. As a strong advocate for this policy change, we would be happy to provide any other information your hospital needs as you prepare for this important reimbursement update. All Medicare lower extremity total joint replacement procedures are currently assigned to the same Medicare severity diagnosis-related group (MS-DRG) for payment purposes, even though TAR procedures are more complex and involve greater resources than total hip and total knee replacement procedures. Specifically, TAR and other total joint replacement procedures track to either MS-DRG 469 or 470 (Major Joint Replacement or Reattachment of Lower Extremity with and without major complication or comorbidity (MCC), respectively). Almost all TAR procedures (and revision of TAR procedures) track to MS-DRG 470, which has a fiscal year (FY) 2017 payment of $12.326,1 Wright on several occasions has submitted comments to the Centers for Medicare & Medicaid Services (CMS), presenting data showing that TAR procedures are more costly for hospitals than other types of joint replacement procedures. We have requested that CMS revise the MS-DRG / payment assignment for TAR procedures to more accurately compensate hospitals for the costs of performing these procedures. On 14 agosto 2017, CMS published its final rule to update the Medicare acute hospital inpatient prospective payment system (IPPS) for FY 2018. 2 As Wright recommended, CMS agreed to assign all TAR procedure cases3 to MS-DRG 469, even when there is no MCC reported. This results in a roughly 55% payment increase (almost $7.000) for TAR procedures compared to payment under MS-DRG 470 for FY 2018, which begins 1 ottobre 2017. CMS also agreed to assign all revision of TAR procedures6 to MS-DRG 469, even if there is no MCC present, for FY 2018, with a payment rate of $19.296. CMS determined that assignment of all TAR procedures including revisions would more accurately account for hospital resources/costs associated with performing these surgeries than the current framework. The FY 2018 rate change applies only to Medicare acute hospital/IPPS cases. Note that in some cases, private/commercial insurance plans base payment on Medicare rates. Specific private payer reimbursement varies by payer/contract. Wright è un'azienda, specializzata nel settore dell'ortopedia, che fornisce soluzioni basate su impianti articolari e biomateriali grazie alle quali professionisti in campo medico possono alleviare il dolore e ripristinare lo stile di vita nei pazienti. We are a recognized leader of surgical solutions for the upper extremities (shoulder, elbow, wrist and hand), lower extremities (foot and ankle) and biologics (synthetic and tissue-based bone graft substitute materials) markets. 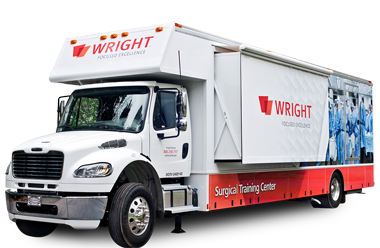 Wright is committed to finding and delivering the best possible solutions to patients, providers, and Medicare. We would be pleased to help your hospital understand the new Medicare policy and answer any questions you may have. For questions or for more information, please email [email protected]. This information is presented for informational purposes only and is accurate as of its date of publication. È responsabilità del centro medico segnalare i codici che descrivono esattamente i prodotti e i servizi forniti ai singoli pazienti. Providers should contact the appropriate payer if they have questions and follow the payer’s billing guidelines. 82 Fed. Reg. 38029 (Aug. 14, 2017). Note Medicare only covers TAR procedures in the inpatient hospital setting. The text of the rule and payment files are available at https://www.cms.gov/Medicare/Medicare-Fee-for-Service-Payment/AcuteInpatientPPS/FY2018-IPPS-Final-Rule-Home-Page.html. This policy applies to the following ICD-10 codes: 0SRF0J9 Replacement of right ankle joint with synthetic substitute, cemented, open approach; 0SRF0JA Replacement of right ankle joint with synthetic substitute, uncemented, open approach; 0SRF0JZ Replacement of right ankle joint with synthetic substitute, open approach; 0SRG0J9 Replacement of left ankle joint with synthetic substitute, cemented, open approach; 0SRG0JA Replacement of left ankle joint with synthetic substitute, uncemented, open approach; and 0SRG0JZ Replacement of left ankle joint with synthetic substitute, open. Note that actual Medicare payment amounts vary from hospital to hospital. The referenced rates apply to hospitals that have submitted quality data and are meaningful electronic health record (EHR) users; slightly lower amounts apply to other hospitals. Other adjustments also may apply. CMS is changing the titles of MS-DRGs 469 and 470 to reflect these reassignments: MS-DRG 469 — Major Hip and Knee Joint Replacement or Reattachment of Lower Extremity with MCC or Total Ankle Replacement; and MS-DRG 470 — Major Hip and Knee Joint Replacement or Reattachment of Lower Extremity without MCC. Revision of TAR cases are coded using a combination of codes with the root operation Removal and Replacement. Removals: 0SPG0JZ Removal of Synthetic Substitute from Left Ankle Joint, Open Approach; and 0SPF0JZ Removal of Synthetic Substitute from Right Ankle Joint, Open Approach. Replacements: 0SRF0J9 Replacement of right ankle joint with synthetic substitute, cemented, open approach; 0SRF0JA Replacement of right ankle joint with synthetic substitute, uncemented, open approach; 0SRF0JZ Replacement of right ankle joint with synthetic substitute, open approach; 0SRG0J9 Replacement of left ankle joint with synthetic substitute, cemented, open approach); 0SRG0JA Replacement of left ankle joint with synthetic substitute, uncemented, open approach; and 0SRG0JZ Replacement of left ankle joint with synthetic substitute, open approach. Database sui pagamenti "Physician Fee Schedule"